Since the pot is very deep, watering is an issue. Yes, I can always water along the outside of the pot, allowing the water to find the pockets and fill in. 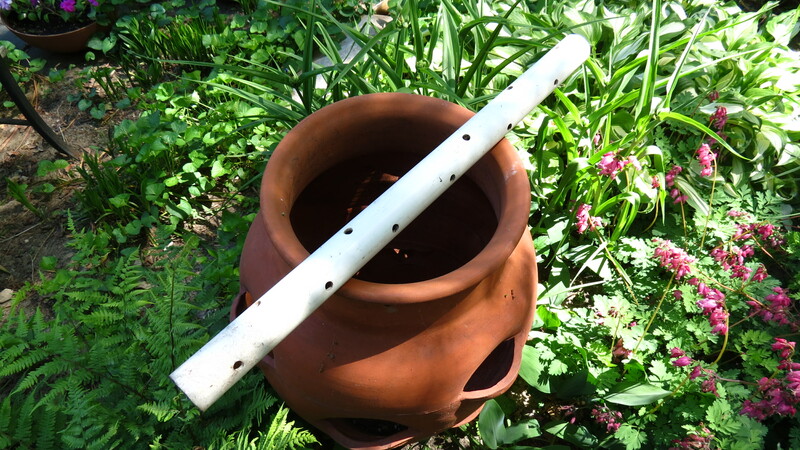 But for deeper watering, I use an old trick that I picked up from Martha: a PVC pipe with a series of homemade holes. To begin, I place a shard of shattered pottery in the bottom of the pot, and then a layer of soil. The PVC pipe is then inserted. The tricky part is filling the pot with soil. Since I am right-handed, I cover the top of the PVC pipe with my left hand as I shovel in dirt. Every few minutes, I tamp down the soil. Eventually I reach the first level of pockets. Planting in a strawberry pot can require some patience as each plant plug is coaxed and eased through the pocket opening. The pockets in this particular pot are slightly irregular. 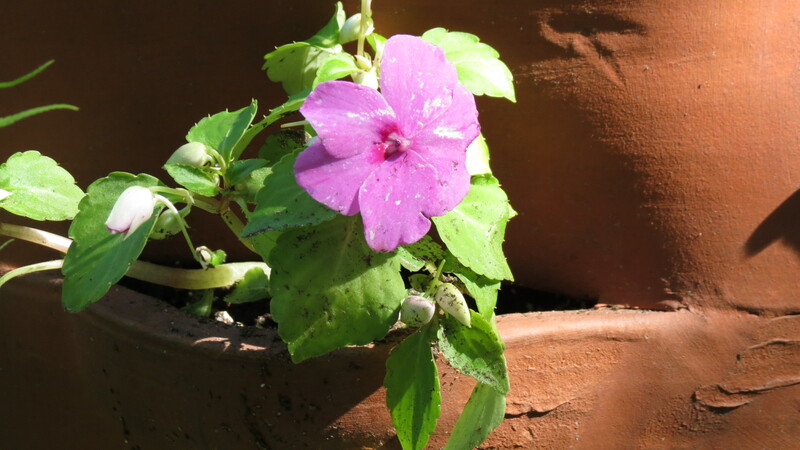 The lower openings are shallower, and so my plants (in this case, Impatiens that I started from seed) are negotiated into place from the inside of the pot. I make a small depression in the dirt leading to a particular pocket. I then ease the plant into place, and use the dirt in the pot as a cushion. 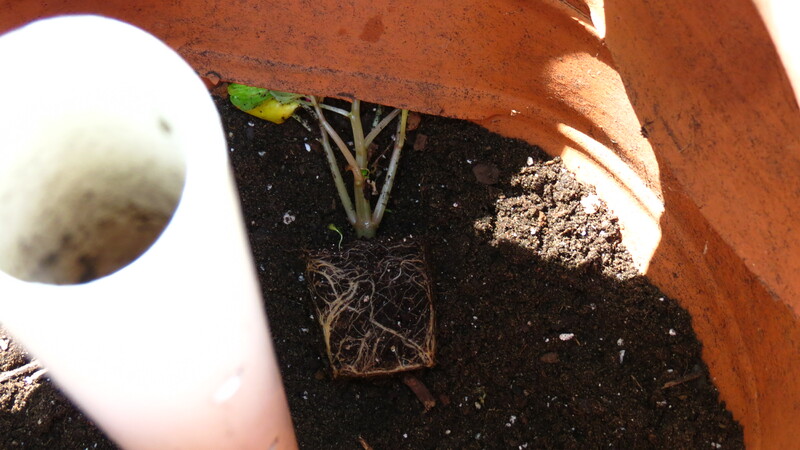 I never place the roots of the plant against the terracotta, which is a porous material, so the roots do not dry out. Once one level is completed, I water in the plants, and add more soil – always being careful to not drop any into the PVC pipe. Each level is planted in the same manner, except the upper level. In this pot, the upper pockets are slightly larger, and so I can easily plant the roots into the pot from the outside. When planting a pot like this, it’s also important to know and understand the shape of the pot. Here, there is a hollowed out area just below the neck that needs special attention to guarantee that soil fills it up. This just requires some hands-on TLC by adding dirt and tamping it into the pot’s shape. 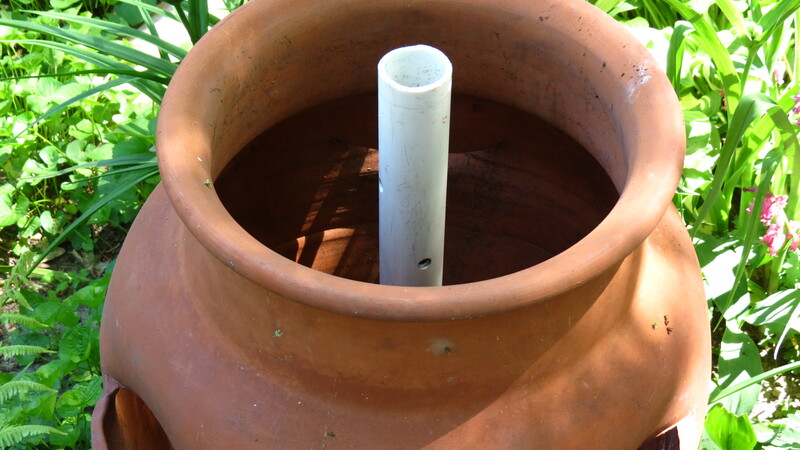 At last, the upper most area is reached, and the end of the PVC pipe should be visible above the soil level. Once the plants fill in, the glaring white tube will hardly be visible. During dry weather, your plants will thank you as you take the hose or watering can, and simply aim it into the pipe and fill it up. Water will now seep through the drilled holes and into the deepest of soil. Now that the planting is done, the whole thing can be hosed off in order to rinse off any crumbs of soil. We, my pot and I, are now able to resume our relationship, our traditions and routines – for a summer of love. Terracotta love. Great idea! Thank you Kevin and Martha. Very informative! Nice idea, too, flowers instead of strawberries. Thanks! 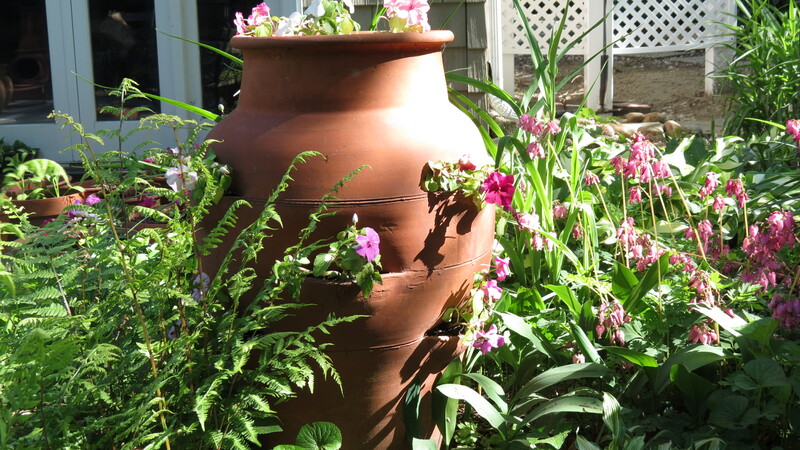 I used to “hate” filling this pot b/c it was so deep, and in the summer my plants would get parched. How ingenious is the pvc watering pipe idea? Leave it to Martha. Thanks for sharing. I’ll give it another try. Hi Carla. It’s definitely worth a shot. I’ve tried many Martha ideas, and every so often, one of her good things is a winner. Herbs would be amazing in a large pot. I’ll hold onto that idea for next year. Now that is a great tip Kevin on watering a deep container. I will have to remember that one. Thanks. Hi Lona. It works out pretty well, especially in dryer periods. Hope it works for you. Gorgeous! I can see why you love the pot. I’ve never owned such a beauty, and I do like large pots for the structure they can give to a garden. I love how terracotta takes on different colours, and release salts as they age too. I’m off to check out the blog you recommended! Hi Claire. 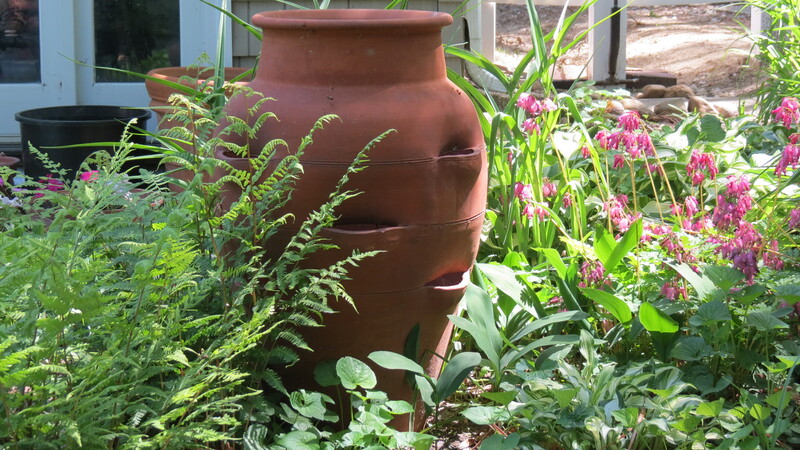 If I can live quite vicariously through your amazing blog, then you can enjoy some terracotta envy. 🙂 I completely agree with you about the aging process and salts. I appreciate terracotta’s earthiness. Debra, great to hear from you. Succulents must look spectacular in the pot — but the PVC trick may open up a whole new world for you and your pot. Good luck with it. I’m in love with a terracotta strawberry pot too! This affair has been going on for 10+ years. It has been planted with black and blue salvia for the past four years. I just leave the lovely pot alone aside from watering, and the salvia just comes right back each spring. I dread the day we have to part. Enjoyed your post, Kevin. I’m jealous that you can look at your terracotta year-round. I have to unplant mine and pack it away for some winter hibernation. Enjoy the day! I’ve decided I need a strawberry pot. Yours is fabulous! And such great tips, too! I would have never thought of the PVC pipe in the middle. Yours looks beautiful. At three feet, it is a real focal point! This whole thing looks a little confused to me though. It’s not only you and your terracotta pot here, there’s this Martha as well who makes the thing a triangle, and on top of that? Impatiens enjoying a rubber pillar… This is not amore, this is fun!!! You make gardening sound dirty! 🙂 I assure you, it’s all good clean fun. Judging by the blog names you are the dirty one, I am innocent my dear. Hi Beverly. Sadly, I don’t have any resources. I actually stumbled upon my large strawberry pot in a small nursery. I was driving by and saw the sign for an end of season sale — which resulted in the fastest u-turn ever. I haven’t seen one since — and if I have, it’s usually quite expensive. You might try looking on-line or asking any nurseries in your area to start stocking some. If I come across any retailers, I’ll pass it on. Good luck!